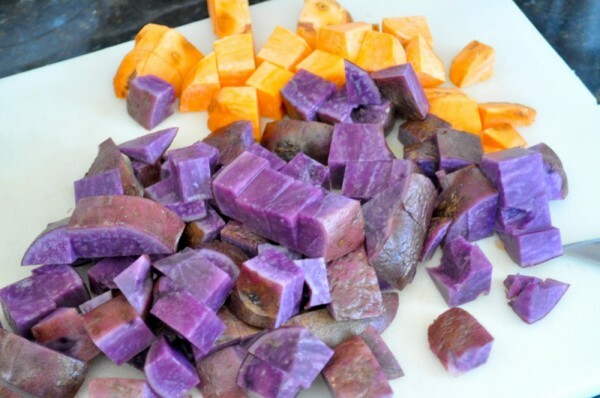 Anyway…we had two paper sacks of potatoes (some purple and some white) and a couple of random sweet potatoes. 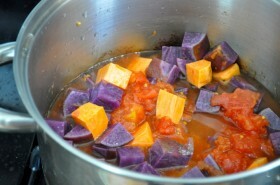 The purple ones were starting to sprout and the sweet potatoes were drying out. Never fear! Curry is here! 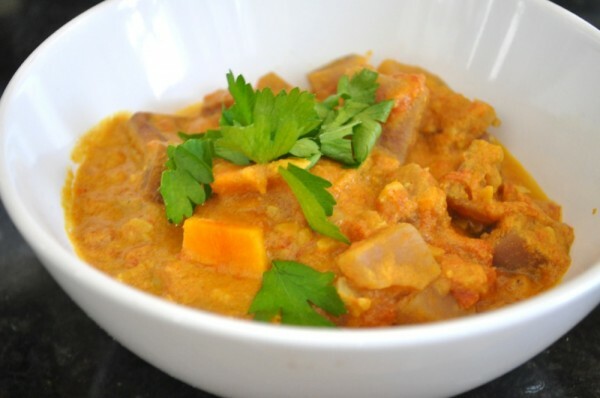 Super delicious, super easy curry, that is. This recipe is from Wildly Affordable Organic by Linda Watson, the genius behind Cook for Good. Erik and I tried to take the Cook for Good Challenge a couple of years ago, but had to bail due to some unexpected business travel. We got some great recipes out of it, though. This is one of them and I’d definitely recommend it for the night you get home late from work and are tempted by the takeout menu. It only takes about 25 minutes and is made from ingredients you probably have already. This is filling enough that I don’t think rice is necessary, but put some on before you start the curry if you want it. 2 TBsp Tahini Give it a good stir to distribute the oil. Dice the potatoes into 1/2 inch cubes. In a medium pot, add the potatoes, tomatoes, water (or water/tomato juice mixture), and salt. Cover the pot and bring it to a boil. Once it boils, turn down the heat so that it simmers gently. While the potatoes are cooking, chop the garlic finely. You could also put it through a garlic press, but I prefer to mince it with a knife, since I already have the cutting board out. 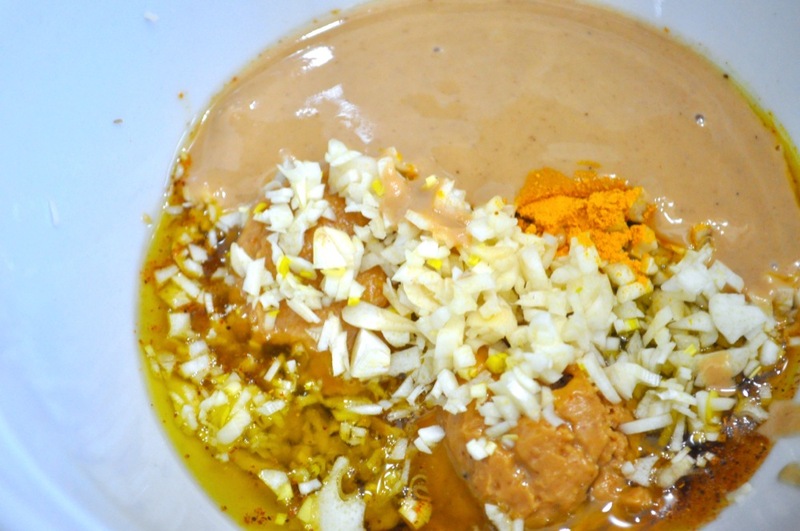 Put the garlic, vegetable oil, tahini, peanut butter, and cayenne pepper into a microwave-safe bowl. (Note: I accidentally put the turmeric in, too, which I wasn’t supposed to do. It turned out great.) Microwave on medium-high (80%) for two minutes. 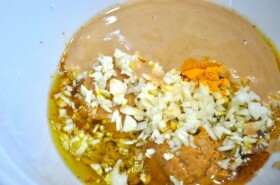 Add the turmeric to the tahini-garlic mixture, if you didn’t already, and stir it into the cooking potatoes. Let the curry continue to simmer until the potatoes are tender. This will take about 15 minutes, if you made the tahini-garlic sauce at an average speed, or 5 minutes, if you, like me, had to run to the store for tahini you though you had, but didn’t. Garnish with a little sprinkle of parsley. I think this would be good with a dollop of yogurt, too. We, too, are slowly making our way through the last bags of potatoes, so I can’t wait to work this recipe into the queue. Yum! Another thing to add to my “when we buy a house” list. A backyard to bury potatoes in. Every girl’s dream! I think Alton Brown simulates that with a bin of sand. I might give it a try.